The Program was developed by the Archdiocesan Office of Vocations in 2001 to encourage families to pray together for an increase of vocations to the priesthood and consecrated life. With the help of the Serra Club of the Saint Charles Deanery the parish will participate in this program to help cultivate an increased awareness of God’s plan for our lives and help cultivate a positive environment to foster future vocations within the Archdiocese of St. Louis. 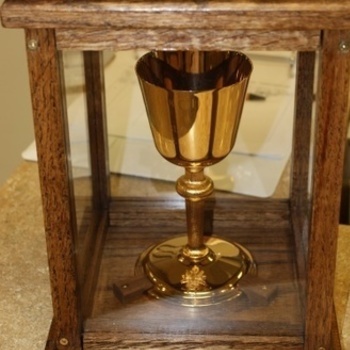 Each week parishioners that have chosen to participate will receive the chalice, which is mounted in a glass and wooden frame box, and the binder of daily vocation prayers. The family will take the chalice, as a symbol of the priesthood, to their home and display it in a prominent place for all to see throughout the week. Each day for seven days the family will gather together to pray for vocations guided by the use of the prayer binder. During this time parents can explain and prompt young children and teenagers to consider how God is calling them into a deeper relationship with Him. We trust through this program God will grant many blessings to our parish families. It is a great opportunity to pray together for such an important issue. If interested in participating please fill out the form below. You will be contacted with an email confirmation of your scheduled date. 1st weekend mass choice - choose date REQUIRED Please fill out this field. Please enter a date. 2nd weekend mass choice - choose date REQUIRED Please fill out this field. Please enter a date. 3rd weekend mass choice - choose date REQUIRED Please fill out this field. Please enter a date.